Education Department officials dismissed complaints against Brown and Dartmouth but said they had enough information to investigate at Yale. 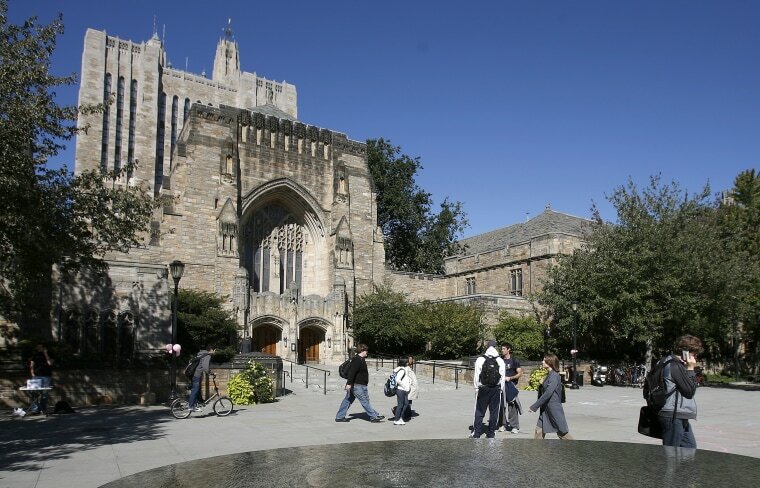 The Trump administration is opening an investigation into Yale University's admissions practices following accusations that it discriminates against Asian-American applicants, officials said Wednesday. It's the latest in a series of federal inquiries taking aim at admissions practices used by the nation's most selective colleges, and it comes less than a month after the Justice Department sided with an Asian American group that's suing Harvard University over similar accusations. The Yale investigation responds to a 2016 complaint from the New Jersey-based Asian American Coalition for Education. In it, the group accuses Yale, Brown University and Dartmouth College of unfairly denying Asian Americans admission based on their race. Education Department officials dismissed the complaints against Brown and Dartmouth but said they had enough information to investigate at Yale. In a letter to the coalition Wednesday, they showed special interest in "a particular Asian American applicant's experience applying to Yale." The coalition's complaint notes that the percentage of Asian Americans at Yale and other Ivy League schools has declined even as they make up a growing share of the U.S. population. It says the decline has been fueled by negative stereotypes and that schools apply tougher admissions standards for Asian Americans. The Education Department said it doesn't comment on ongoing investigations. The Justice Department declined to comment on the Yale case but said it "takes extremely seriously any potential violation of an individual's constitutional rights." Yale President Peter Salovey strongly denied the accusations, saying the school's admission process considers "the whole person" and has created "a vibrant and varied academic community." "This investigation takes place in the context of legal challenges at other universities aimed at overturning Supreme Court precedent permitting the consideration of race in college admissions," Salovey said, adding that he will affirm Yale's "unwavering commitment to diversity." The investigation at Yale was reported first by The Wall Street Journal. Yukong Zhao, president of the coalition, said he's glad the Trump administration is taking "concrete action" to provide equal treatment for Asian American students. The group was formed in 2014 to take action against Ivy League admission practices that the group says work against Asian Americans. It also filed a 2015 federal complaint against Harvard that the Justice Department took up last year and is still investigating. A separate group, Students for Fair Admissions, sued Harvard in 2014 over claims that it is tougher on Asian American applicants and consistently gives them lower scores in categories that rate their personal characteristics. The case is scheduled to go to trial in October. On Aug. 30, the Justice Department issued a "statement of interest" in the Harvard case, supporting the group behind the suit and accusing Harvard of "engaging in outright racial balancing." In a response filed Wednesday, Harvard said the department's analysis was "flawed" and called it a "thinly veiled attack" on past Supreme Court decisions allowing schools to consider race in applications. Many universities defend approaches that consider an applicant's race among other factors as a way to bring a diverse mix of perspectives to campus, and the Supreme Court narrowly upheld the practice in a 2016 ruling. But the Trump administration's interest in the topic has revived the debate over race in admissions. Responding to news of the Yale investigation, some conservative groups renewed their calls to remove race from admissions. "It is time for Harvard and other top schools that consider race and ethnicity in the name of 'diversity' to stop what they are doing," said Mike Gonzalez, a senior fellow at the conservative Heritage Foundation in Washington. "This is 2018 and the government should follow a color-blind approach." But others say courts have long given schools the freedom to assemble their student bodies as they choose. Peter McDonough, general counsel for the American Council on Education, which represents 1,800 college and university presidents, said the debate goes beyond admissions practices. "This is really about institutional autonomy," he said. "One of the things that has made our higher education system in America the envy of the world is that it's so diverse. And concepts of freedoms and academic freedoms aren't to be taken lightly."